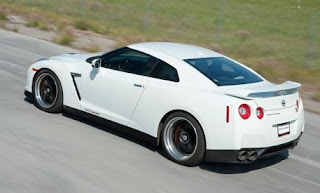 Sam Mitani from Road and Track Magazine recently tested a 2009 Nissan GT-R modified by Hennessey Performance. The package called GTR600 includes upgraded 47mm turbochargers, exhaust, ECU modifications, intercooler piping, and wastegate acuators. All this results in 642 bhp at 6400 rpm and 611 lb.-ft. of torque at 4500 using premium gasoline (Hennessey claims that it'll pump out 700 bhp with racing fuel and boost turned up to 21 psi). The launching system limited engine revs to just about 2700 rpm with VDC on or off. Take your foot off the brake pedal, and you could swear the GTR600 is about to go airborne as it leaves the line. The GTR600 hit 60 mph in a scant 2.9 seconds and reached 100 mph in 6.5. The quarter-mile mark goes by in10.8 sec. at 130.4 mph. Hard to believe, but this thing made the GT-R SpecV feel slow...With race gas and the boost turned up, the GTR600 hit 193.8 mph in the standing mile, said Hennessey, and it hit 150 mph in just 14.3 sec.